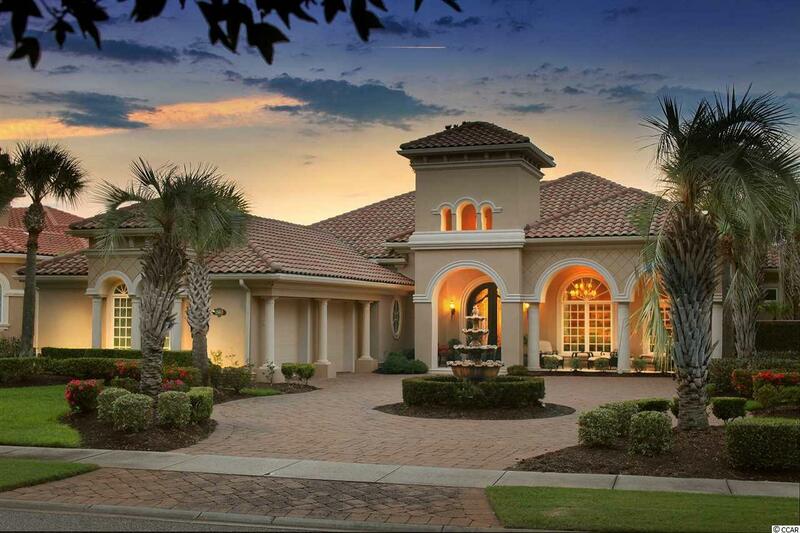 This luxurious 4,600 heated square foot home is fully furnished and is truly a piece of paradise! This home was the builders Model Home and is loaded with tons of the highest end upgrades. The Master Suite is truly grand with tray ceilings, a morning kitchen, a separate bedroom-sized sitting room, and a private court yard with hot tub. The Master Bath has marble flooring, granite counters, a custom built-in linen cabinet, and an over-sized Jacuzzi tub with interior lighting and water feature. The massive walk-through shower has abundant natural lighting and three varying shower heads, including a rain water head. The Master Suite includes expansive His and Hers walk-in closets with built-in custom cabinetry and mirrors. 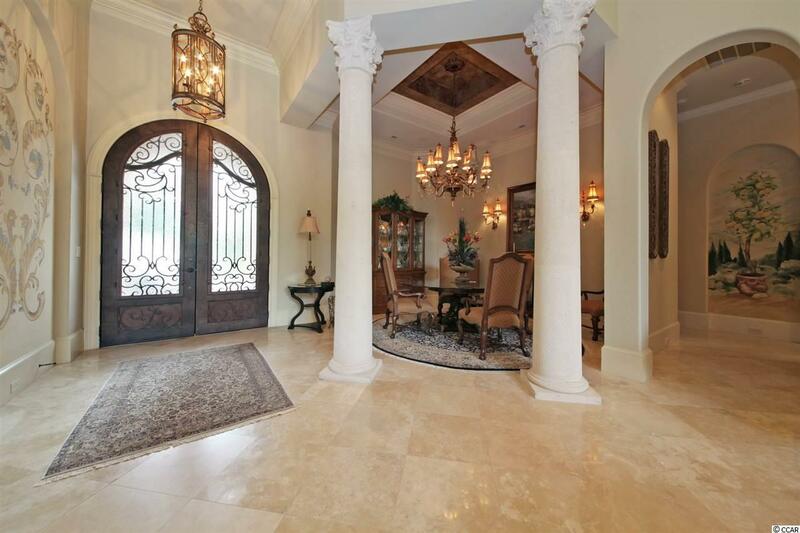 This exquisitely decorated Mediterranean home includes tray, coffered, and tin ceilings with elegant murals adorning the ceilings and walls throughout. The professionally designed interior furniture and decorations complete the sophisticated Mediterranean d'cor. 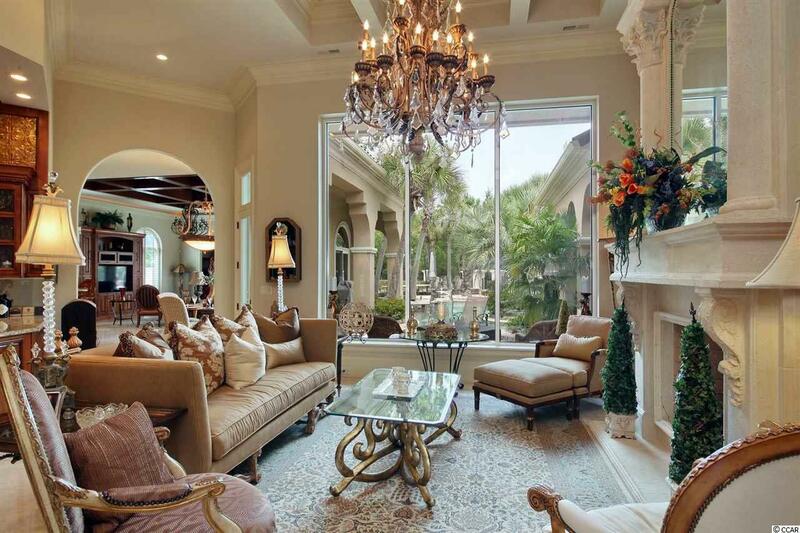 Crystal and Over-sized chandeliers are perfectly suited to each respective room size. Travertine marble shines throughout the home. The structural systems include five climate control zones, including two silent, ultimately high-end variable speed systems for the Master Suite. There is a wireless bluetooth SONOS sound system with built-in speakers throughout the Family Room, Kitchen, Living Room, Dining Room, Library, and outside around the pool deck. This home also comes with gas burning fireplaces in the Living Room and Sun Room. The Sun Room is a bright and beautiful gateway to the Oasis in the back yard and includes a second outdoor style kitchen. The Kitchen includes appliances with cabinet matching wood paneling and upgraded Thermador refrigerator-freezer and dishwasher. The Kitchen also includes granite counters and a four burner gas grill with an adjoining additional gas grill and gas griddle. Both the Kitchen and Master Bath sinks have separate purified water system capability. This home is also whole-house vacuum capable and has two water heaters, i.e., one for each side of the house. The laundry room comes with a high-end Maytag washer, dryer, and drying cabinet. The 2 car garage has a storage closet, plenty of cabinet and shelf space, recessed lighting in the bays, quiet belt-driven remote garage doors, and an attic walk-up staircase with 200 square feet of storage space over the garage. The house walls are Insulated Concrete Foam (ICF) and are excellent for quiet and thermal insulation. The backyard Oasis includes numerous landscape designer placed palm trees, an outdoor shower, the wireless SONOS sound system, a wood-burning fireplace, and exquisitely designed heated pool complete with two water features and an adjoining hot tub. The pool has rotating colored lighting, is ADA equipped for pool and hot tub access, and is set amid a backyard designed with a myriad of rose bushes and double blooming plants. This home has a professionally designed exterior with more than 40 professionally placed landscape lights throughout the front, side, and back yards. Designer decorated mosaics also adorn the kitchen, sunroom and master suite private courtyard. The Grande Dunes is a gated community on the Intracoastal Waterway with 24 hour security, two golf courses and automatic membership to the spectacular Ocean Club on the Beach and is located near all of the best attractions that the Grand Strand has to offer! !